Home › Ascension Personal Experiences › Question of a Lifetime – What is Ascension, When will it finally happen!? 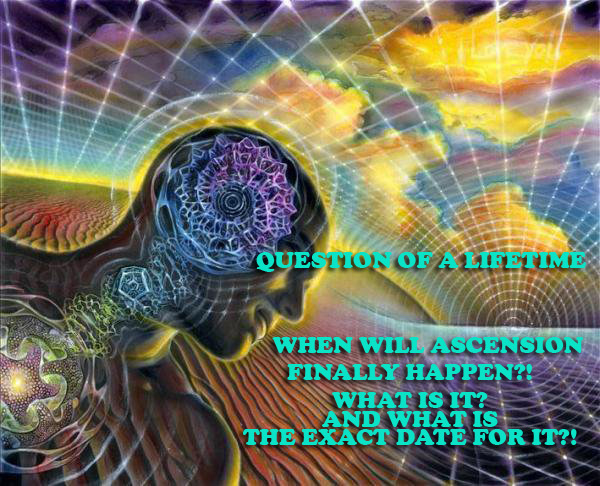 Question of a Lifetime – What is Ascension, When will it finally happen!? Based on everything that I know, and all of my encounters, private and public channelings the answer is this.. The reason that there is no date and the difficulty is that humanity as a whole is the one responsible for their own ascension times. Its not going to happen over night, every day there are slight changes and energy influxes to assist us in ascension process. However, it’s strictly on individual basis. Some of us have chosen to ascend in groups, and thus there are waves of awakened ones that will continue to go on and on for a while. 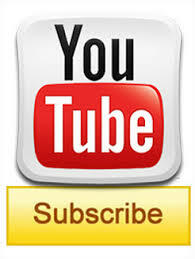 If you read my channelings you will see that it is mentioned quite often, DO NOT WAIT FOR ANYTHING, start acting NOW. Live in the present reality and if you don’t like it CHANGE IT. The point of ascension is not to wait for someone to come to you and bring it to your on a silver platter, or for the ships to land. All that will happen, the ships will land eventually, of course we are not alone in this vast universe and our galactic families are nearby. BUT they are not going to ascend for you, and it’s your responsibility and yours alone. So many are confused about ascension, and really its nothing more than finding the balance within and realizing that your EGO is not your enemy, it’s your friend you just have to keep in in balance. It’s a realization that you are not your body but your soul. Its a realization that we are all ONE and are here to learn lessons, and as such we all must FORGIVE each other and our own selves. When you finally stop running after ascension and waiting for something grand to happen, but instead allow yourself to just be in the moment and listen to your own intuition and your own heart it’s then that you are going to feel that you have ascended. You will treat yourself differently, and others around you as well. Your heart will no longer focus on the revenge but mercy and forgiveness, complete understanding and unconditional love. Your life will begin to flow as it was meant to be, and if you don’t like it you will see that you are powerful enough to change it. So do not wait for any particular date. As I said, all of these are PORTALS that bring influxes of energy in order to help us here and assist us, with this light, the energy that is brought down to earth, opens up a lot of peoples energy gateways as well as brings DNA upgrades with it. So when you see another channeling saying that a portal has opened up, take the opportunity to allow yourself to experience the light and love that comes with it. Open your heart to this divine energy and allow your life to flow the way that you meant it to be before coming here. Wait for no one, YOU ARE your own savior and messiah. And when you realize that it is so, you will see the changes that you are seeking. In the meantime take this time to let go of everything that you have within you, let go of all the blame, let go of anger, and resentment and self pity. Allow yourself to walk into your own power, because YOU ARE truly a powerful being. Each and every single one of you are! Some of the wisest words about Ascension you will ever hear. Deus Nexus said, Some of the wisest words about Ascension you will ever hear. Thanks you for the timely message. In the first place, so many things (or promises like having our health back, getting our memories back, getting our abilities back, have lost arm grown back, etc, etc) were said – the possibilities of this Ascension period. It was like becoming a superman or going into another new world (which precisely the dimension was mentioned – the idea of being another dimension is another place). All these are confusing for human in term of these terminology which doesn’t define exactly the process of Ascension (or it does but it has not happened yet). And now, some messages saying Ascension is only a PROCESSS or TRANSFORMATION of our attitude towards each others and other living beings. So, in the first place – the word ASCENSION should not be used if this is only a process of transformation of attitude. Probably, those people who got the message got the wrong impression of this Ascension process and they are now correctly it. And this will be a very big let down for most and me too. We were expecting something magnificance and wonderous but the delay had killed our expectation in one goal. AND YET THE CURTAIN IS STILL DOWN … HAHAHAHA!!!!! Did I used the word “SOON”? You know the meaning by now right? Hahaha! May the LOVE be with you always. From what I understand and have experienced ascension is a very personal thing and most definitely it is not something that will simply be handed to you on a silver platter. The fact is – personal ascension is EXTREMELY difficult, challenging and hard work on many fronts. Perhaps more so for some that for others – I think the degree of difficulty is dependent upon many aspects including the personal “baggage” one carries and included in this are the habits of a lifetime up until now. My understanding also is that the ascension of the earth has already happened… and this is something quite different from the notion of personal ascension. I believe the earth’s ascension to higher vibrational frequency did actually happen late last year. Anna… this is a wonderful explanation of Ascension! It’s a process for sure…I especially love your understanding that the balanced Ego plays a necessary role in all of this. It’s function is to protect our Souls from serious damage. I think of it like our spleen…you can live without it I suppose but you’re well being will be compromised in some way. Thank you…I love this!! Reblogged this on Shimmering Blue. Reblogged on Shimmering Blue & thanks for the message! One of the first people to start the understanding about Ascension was a Man called Eric Kline. he prodused many tapes and they were sent all over the world. Arrived at my Doorstep in 1991. It had put a time period of 5 years at that time. I was a teacher of the light at the time and what a wonderful and exciting time it was. I still fully believe in the wonderful ascension to come . for I am aware that every day is bringing us closer. I was given my name at the time of which I write as Zu-Deus. All will take place ,and love will be the way for it to be revealed. Eric Kline`s Ascention tapes,in a series of extraodinary “coincidences”,were placed in my hands on my birthday in 1991.They totally shifted my consensus perception of reality from that day till now.At that time the Ascension was expected to occur in 1995.I also remember one message said “Don`t quit your day job just yet,expecting to be lifted up.”Now the messages say “Imminent.”If we are still in this expecting mode 2 or 3 years from now,I do wonder if I will still be able to keep my faith in all this to be honest with you.And over the years I have also received messages from several Ascended Masters. Reblogged this on Beacon of Aquarius. Can I add a few comments. On the other side of the veil, time is not linear, so it is difficult to make an assessment of Ascension. Ascension will not happen until there is a multitude of souls who are ready to take the next step. There is still a lot of healing that needs to be done, there are still a lot of people that are just waking up. Right now, we are going through a period when a great multitude of souls are waking up. These souls need to be helped and supported on the soul level. When you no longer need to ask when the Ascension will happen, you will be more ready to take the next step. Reblogged this on Liquid Light Arc. You can be sure, if a date of ascension were published, the Cabal would cancel the calender in use, to confuse the public – and state a new calender. We – the ascensers – know life is safe. Put into a timeline, as 3D, life is restricted – it is placed. This is what is called space-time. The scientists defining are within this, and in it they found nothing. As a term, ascension derives from religious readings and is old-fashioned. We use the term energy-shift, which is mindcontrolled by the individual itself. Is as Annamerkaba explain. SO – looking for a date is looking for nothing. Your mind know life. Open it and DO and BE. It is absolutum. As Mark Twain wrote: “Throw the bowlines. . . ” = disappear limitations. It’s happening and definitely up to each one of us that it continues to do so. We are all in a never ending spiral of creation. N’Joy and LOVE !!! I think this whole business about ascension is just nuts. Mind you, the idea of ascension is a great idea, but I think that we have so boxed this concept in that its been turned into something that is horribly distorted. Ascension is an experiential experience that will move you beyond your current conceptual box. You will continue to grow. The shift of the planet is happening, but there isn’t some bus to miss or train to catch. This is a shift from one energetic pole to another. It is a cycle of a vast wheel and its coming full turn now. A lot of things happen to correlate with it since we are a part of the landscape and connected to physical reality. 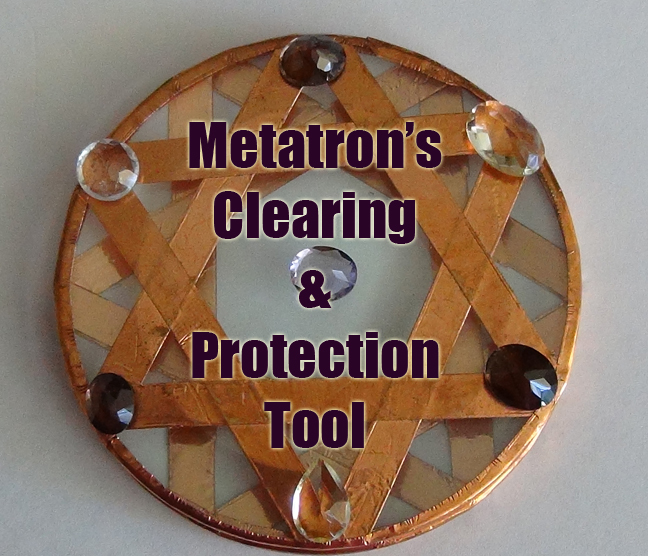 Understanding this means understanding the fundamental spin of the electron, the flow of the negative and positive in your energy field. It is remembering who you are. You are more than this conceptual box you have placed yourselves in. When you shed karmic entanglements and old traumas, you will come to know this wonder that you are. Its all there, piled in under layers of junk. YOUR junk. Time to love yourselves and let go. Of what? The thought that you are limited. That you are anything less than love. Reblogged this on Awakening to Arachanaï. LOL, after writing this, or another channeling, we are trying to tell ourselves to again why it is not happening yet. Our heart never lies, really, hahaha~~~ Everyone is asking themselves why it is not happening and have each of their own explanation, yet, the answer they got never satisfied themselves for feeling sad everything that it is not happening yet. Therefore, everyday we are telling ourselves it will not happening tomorrow so that we can focus on something else, and then the question still remained in puzzle, why are we still hoping that it can be happened just next moment? In fact that we are now doing anything we could to sustain our life, until (WAITING) the event occur. Isn’t that still considering WAITING even thought we are doing something for it to change? What is the difference that we are surviving ourselves or we are working for that hope or we are waiting? The answer is still be same, we are all waiting, it is your brain that trying to trick yourselves doing something which you believe you are not waiting. Everyone is waiting and screaming in the heart. We ARE in our Ascension. When the date of Dec 2012 arrived we had our internal knowing and experience of what that was. For those who remain open to their internal and eternal selves we have collective experiences which are shared. The end of July was another big activation and the knowing of Omega. The end of the Myth of Time. Each wave which comes lets you know what is happening. I do not agree that the ego is our friend. It is not real and so how can we befriend something which is untrue? Healing the split-mind is the whole point. The end of duality and the re-instatement of the single vision. The ego will fight you all the way, because it will cease to be, cease to have any control and fears its death. Self-Realization is Christ Realization and the Oneness of Creation in the Heart of Love. We can kid ourselves a million times that Ascension is happening, but certainly not that which has been described and in the time frame that has been promoted by all spiritual sites and that is why a lot of ‘channellers’ are backtracking. We were given the period from 2012-2015 for us to move to the fifth dimension for the entire planet…well, we only have 7 months left and I see no sign of anything remotely changing ‘physically’. However, I do sense that humanity is finally asking itself questions – about how we treat ourselves, other creatures and the planet and that the system forced on us should now no longer expect our acquiescence. If that is Ascension (even though it is far less than the delights expected by weary lightworkers) it is still better than what was. If only we all wake up and start acting now!